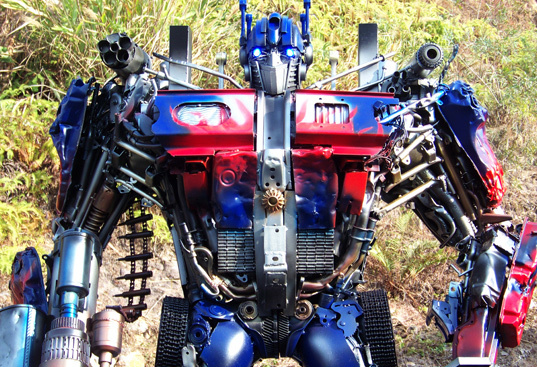 These amazing homemade Transformers fooled us so badly, we're convinced that they're Decepticons... All jokes aside though, we were really impressed by the level of detail found on these robots and by the fact that they were made from scrap metal. 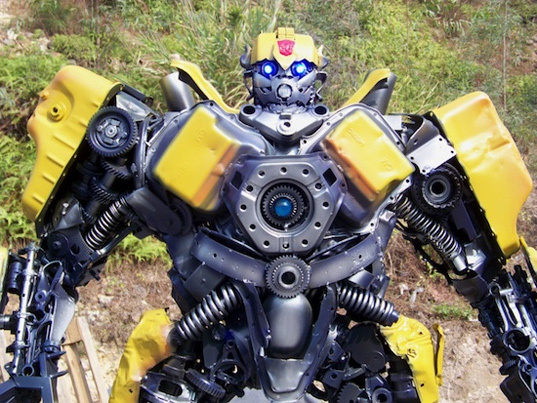 Brought to you by Wing Wah, the same factory that gave us this 5 ton Transformers Megatron tank, the new bots have been painted to look just like the ones in the movie from Bumblebee to Optimus Prime. Designers Jiang Chen and Yang Junlin built the robots as part of their “Legend of Iron” project. Junlin, the head designer, explains that he believes in turning scrap metal into new treasure to reduce waste and to show everyone what can be achieved with it. The new artpieces up the ante by adding paintcolor (an element that the Megatron Tank lacked), making them look even more like the Transformers from the hit movies. It's hard for me to believe that this was once scrap metal. What a great project to show people what can happen if they do something with their scrap metal. I have a few big sheets of scrap metal, I might just have to recycle it. Who knows, maybe it'll be used to make something amazing. Not all the useless things are always useless, especially metals. And what could be more wonderful than using these junked metals as source of interior decorations. These scrap metals are now increasingly being used for decorating corporate buildings, restaurants, public parks, research labs and etc. Unfortunately the robots don't really transform, but they are a way for artists to "transform" trash into treasure. Designers Jiang Chen and Yang Junlin built the robots as part of their “Legend of Iron” project. Junlin, the head designer, explains that he believes in turning scrap metal into new treasure to reduce waste and to show everyone what can be achieved with it. The new artpieces up the ante by adding paintcolor (an element that the Megatron Tank lacked), making them look even more like the Transformers from the hit movies.